This is what I hope to see more of as a result of this project. My project will be created for the audience of the Visit McMinnville Destination Marketing Organization. Visitors to the website will find the story and project compelling because information about kid friendly features in the town will be presented in an engaging way using several forms of multimedia. 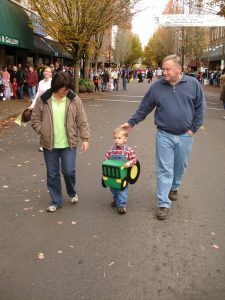 Kid Friendly McMinnville! will tell the story of a family looking for a relaxing getaway. The adults have thought about visiting McMinnville, but know it only as “The Heart of Oregon’s Wine Industry.” The conflict is that they want to visit a place that children can enjoy too. The characters are the people featured on the website. Plot points are all the kid friendly places the family learns about. The narrative is persuasive and the resolution is the invitation to come visit! The story for this project is best told not only with text, but using photographs, video, audio, and an interactive map so that potential visitors have a clear idea of the fun that awaits. The website will have photos of what McMinnville has to offer families, video of children playing at the parks and audio interviews, including a “kids’ eye view,” where visitors will hear young people tell about their favorite places. I will check the weather forecast before scheduling these with outdoor photo and video shoots so the scenes look inviting to tourists. There will be an interactive map marking the places of interest. Hours of operation, if applicable, will be in the linked information. The text will include quotes and other information gleaned from interviews. Sources to contact are Jeff Knapp, Executive Director of Visit McMinnville, Jay Pearson at Parks & Recreation, Cindy Neubig, Recreation Coordinator at the Aquatic Center and Rebecca Quandt, Executive Director of the McMinnville Downtown Association. I have contact information for all four and it is highly likely that I can get access to them or another knowledgeable person in their department. Local families will also be a good source so I will create a simple email survey and send it to a few parents’ groups in McMinnville. For adults who may want to do some wine tasting, the website will point them to the McMinnville Wine Walk and offer ideas for activities children may enjoy on their own for an hour or two. The areas boxed in purple are the parts of the website to be created for this project. 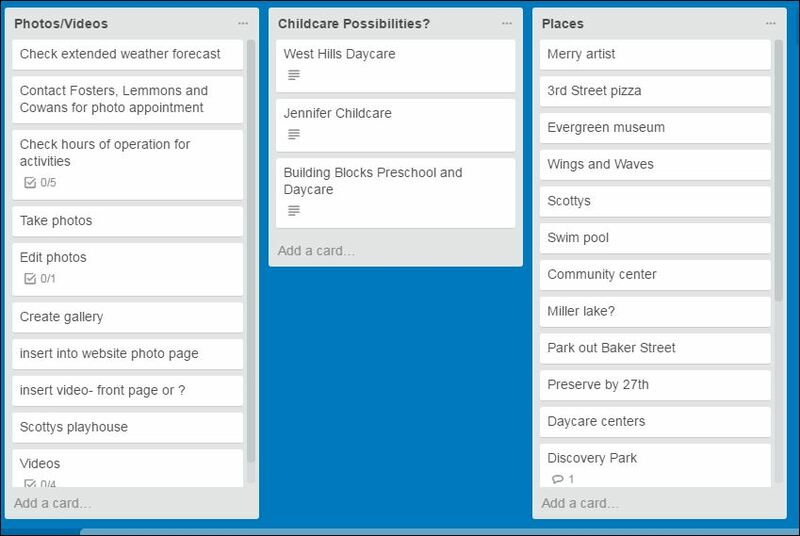 The Trello board breaks the project down in to manageable pieces. The thought of designing a website was overwhelming at first, but after working through the planning process, it became something I knew I could do and do well. 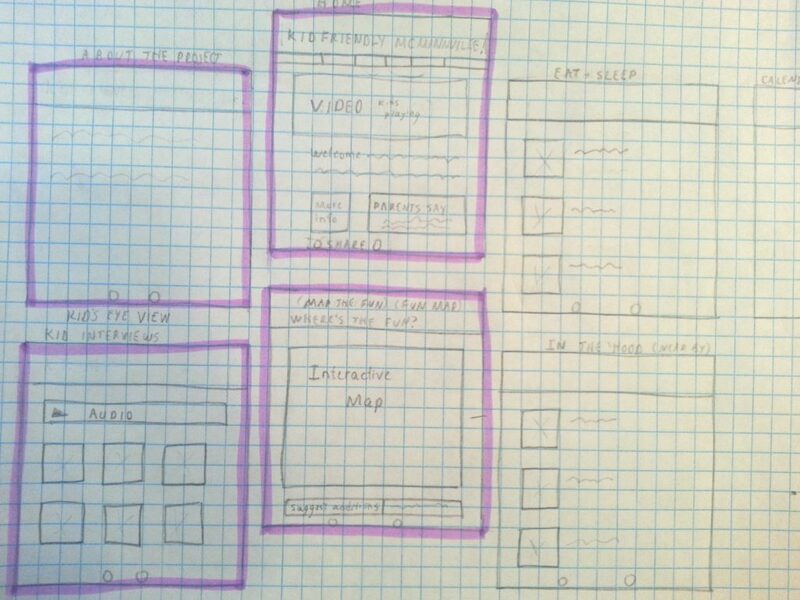 Watching half a dozen YouTube videos about wireframes helped me design one of my own. Several videos suggest using blank, unlined paper but that wasn’t working for me. Uneven lines and not quite right angles were too distracting. Using graph paper took care of that. Knowing how Kid Friendly McMinnville! will look has me excited to start the process of building it. When I created my Trello board, I planned to use it as required for the assignment and delete it. However, I soon realized what a great tool it is. It is so convenient to pick up my phone and quickly add new items to the list as I think of them. I like the way Trello answers the question, “How do you eat an elephant?” You do it one bite or rather, one list at a time. I can see step by step what it will take to make this project a success and that gives me confidence. With the board keeping track of what needs to be done, I do not have to worry I am forgetting something important. In the future, I see far less sticky notes in my life. Trello boards are a great alternative both for school and home. Presented in the major project planning assignment with the possibility of earning a few extra credit points, I experimented with one of the suggested digital productivity tools. I selected Scrivener, a word processor and outline tool for authors. I selected this product because I thought it might be helpful for creating a simple cook book of quick and easy recipes, which is something I hope to do some day. My experience with Scrivener was disappointing to say the least. It is not very user-friendly. After downloading it I learned that there is a two-hour tutorial recommended before using the program. Frankly, I didn’t want to invest that much time in learning something that may not be helpful. After googling to learn a few basics about the program, I set out to give it a try. Though the program looks impressive, in reality it just seemed more complicated than it needed to be. It took many tries before I was able to type in a few recipes. In the end, I decided this tool is not one I will buy after the trial period expires. The program might work for someone more experienced, but it is too complicated for a first time author.